I was slurping my umpteenth spoonful of cold-weather soup, staring at my despairing, pasty reflection in this bowl of noodles and broth, dramatically downhearted and glum while trolling various Jetsetter Caribbean vacations I wasn’t going on—yes, I’ll take another helping of self-pity please— when I clicked on a short article in the New York Times Opinion Pages called This Winter Has Gotten Old. And just like that, my haze of disheartenment lifted. I pictured those yellow daffodils— the most telltale sign of spring—or is it the purple crocuses, peeking up from the snow in the ultimate gesture of awakening? Either way, I was done wallowing. It was time to looking forward, time to anticipate spring! So I made this extraordinary Vietnamese Lemon Grass Beef and Noodle Salad (called Bun Bo Xao). The flavors—crisp, luminous, and revitalizing—mimicked my newfound positivity. In this recipe, root vegetables carrot and daikon radish give a quick nod to winter, but the fresh herbs, tangy sauces, and spicy chili peppers give the dish fresh, vibrant life. It’s the perfect precursor to spring. If you are nervously eyeing the rice noodles’ carb content, try substituting with Shirataki instead: these yam starch noodles contain virtually no calories, and similarly to tofu, are tasteless: a blank canvas for any sauce you choose. 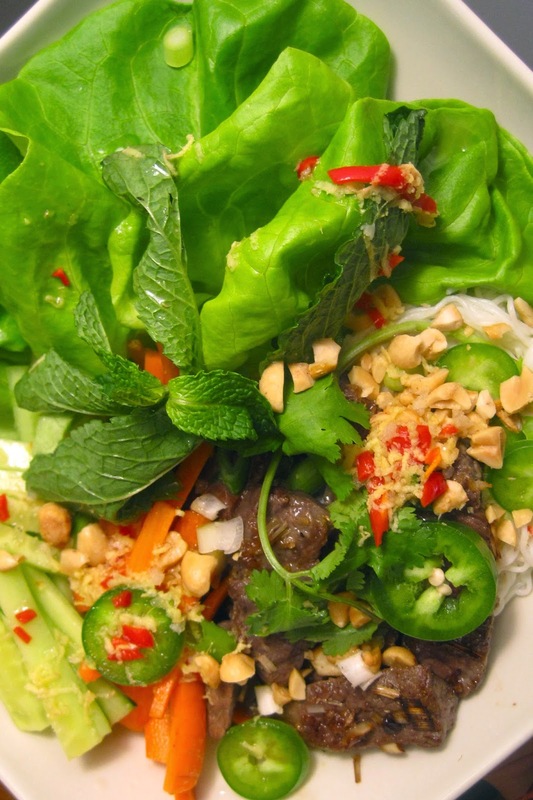 Texture-wise, they’re thin and slippery; spot-on for this vermicelli-seeking salad. This recipe is truly delightful. In addition to achieving bold, intense flavors while remaining buoyant and light, completing the dish feels like quite an accomplishment for the novice Vietnamese cuisine chef. I’ve always put Vietnamese food in the “only for take-out” category, and it was very exciting to discover how accessible this ethnic food type can be in your own kitchen. So make this dish, think of daffodils and crocuses, and remember: spring is on the way! *I recommend doubling the vegetables, and/or adding julienned red pepper slices and shredded Napa cabbage too. You’ll want them to soak up extra sauce! 2. Bring a large pot of water to the boil. Add rice noodles, stir and turn off heat. Let noodles soften (5 to 8 minutes, depending on brand; if using Shiritaki noodles, cook according to package directions), then drain and rinse with cold water. Leave in colander at room temperature. 3. Meanwhile, combine beef, fish sauce, sugar, garlic and lemon grass in a bowl. Massage seasoning into beef and let sit for 15 minutes. 4. Line a serving bowl or four individual large wide soup bowls with a few lettuce leaves and top with noodles. 5. Heat the oil in a wok over high heat. When wok is nearly smoking, add beef and quickly stir-fry until lightly browned and just cooked, about 2 minutes. Work in batches if necessary so meat browns and doesn’t steam. (If you do not have a wok, you may use a cast iron skillet and work in batches.) Note: do not overcook! I cooked for 4 minutes, and the beef was way too chewy. 6. Top noodles with cooked beef, scallions, carrot, cucumber and daikon. Sprinkle with herbs, and crushed peanuts (plus fried shallots and sprouts if using). Drizzle lightly with dipping sauce and pass remaining sauce at table.